Today, I made scones. Scones again you might say, since that was what I posted last. Well, I bought I big jar of original English clotted cream for the last scones. I was happy to even find it here in Germany, but there was a lot left. And what else can you do with this delicious spread than putting them on scones. So, I needed more scones. 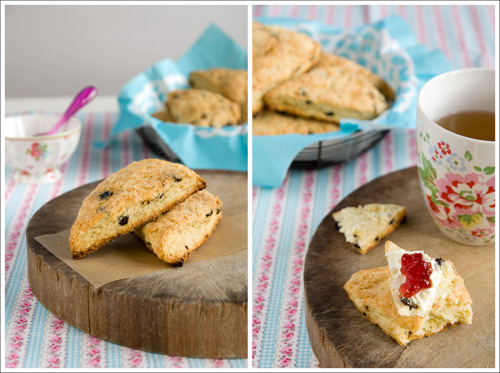 But this time I made the American version, the scones I like most. The most obvious difference to the British version, which Americans call biscuits, is the shape, triangle versus round. American scones are also more crunchy on the outside. The baking process is similar as you carefully rub the butter into the dry ingredients without totally incorporating it and then adding the liquids at once. This way you will have the desired flaky texture. I chose a recipe from one of my favorite cookbooks, from the famous San Francisco bakery Tartine. The scones, buttermilk scones to be exact were awesome, like everything I baked from the Tartine book so far. They are crunchy and flaky, not too sweet and were great with the clotted cream and some homemade blood-orange marmalade. Sift the flour, baking powder and baking soda into a mixing bowl. Add the sugar and salt and mix together. Add the butter and carefully cut the butter into the flour using a pastry blender (you can also use your hands if they are really cold). The mixture should be coarse with pea sized pieces of butter. Add the buttermilk, lemon zest and currants all at once and mix gently with a wooden spoon until the dough just holds together. Don't overwork the dough, you should still see pieces of butter to achieve a flaky texture for the scones. Dust your work surface with flour and place the dough onto it. Shape the dough into a circle approximately 3.5 cm (1-1/2 inches) thick. Cut into 8 triangles pieces (like cake slices). Transfer them onto the prepared baking sheet and brush the tops with the melted butter. Sprinkle with demerara (or brown) sugar. 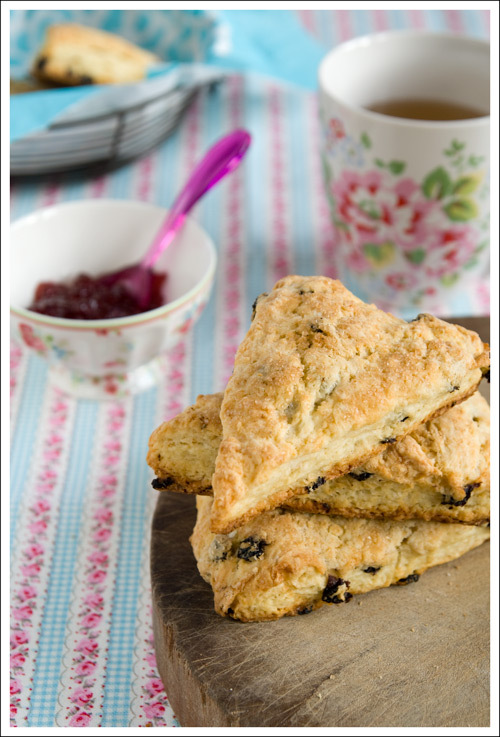 Bake the scones for about 25 to 30 minutes, until the tops are lightly browned. Serve warm.